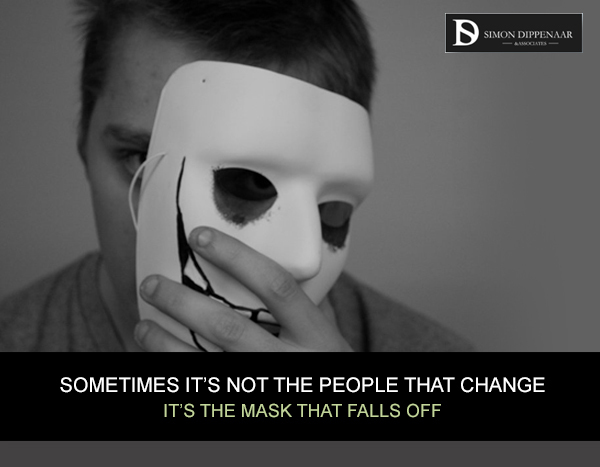 The other day I came across this quote, “Sometimes it’s not the people that change, it’s the mask that falls off”, and it immediately brought to mind the recent film, Gone Girl. If you’ve seen Gone Girl, starring Ben Affleck and Rosamund Pike as Nick and Amy Dunne, then you’d know that it is a suspenseful psychological thriller, loaded with twists and sinister plots. There are also many powerful, and thought provoking lines in the film. “When I think of my wife, I always think of the back of her head. I picture cracking her lovely skull, unspooling her brain, trying to get answers. The primal questions of a marriage: What are you thinking? How are you feeling? What have we done to each other? What will we do? – Nick Dunne. Amy disappears from their home in a small town in Missouri, and Nick’s lies, deceitfulness, and strange behaviour soon make him the prime suspect. The film is a portrait of a marriage, and rivals any Alfred Hitchcock plot. Nick and Amy’s marriage is gradually dissected to reveal the hidden secrets that caused their marriage to disintegrate, and to unwind the circumstances of Amy’s disappearance. While the film is bizarre, unrealistic, and exaggerated, it nevertheless touches many of the common chords of marriage disintegration. It exposes the emotional conflicts, feelings of being trapped, and disillusionment that are so common to many broken marriages. At Simon Dippenaar & Associates Inc., we understand the tumultuous emotions associated with divorce, and how difficult it is to make the right legal choices amidst the conflict – choices that will not leave you high and dry further down the line. Those decisions may involve your children, your finances, your property, your safety, your emotional wellbeing, and many more. We’ll shoulder the legal burden for you. Our expertise in the field of family law, and our ethos of putting children first, as well as seeking the best resolution for all concerned, in a responsible, and professional manner, set us apart as an emotionally intelligent law practice. Our legal services cover all aspects of family law, divorce, including child custody, consent agreements, mediation, parental alienation, maintenance, and child abduction. If you need my help, contact me on +27 (0) 86 099 5146 / sdippenaar@sdlaw.co.za. This entry was posted in Divorce and tagged divorce, divorce attorneys. Bookmark the permalink.